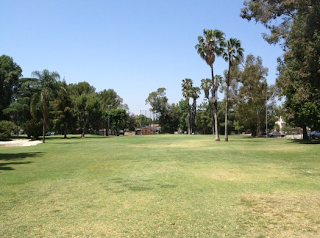 This course is located in Lake Balboa by the Van Nuys Whiteman airport. In fact it is right in the flight path and you can see small aircraft flying over (as you can see in the picture above). The golf course complex comprises of a 18 hole par 3 course, an executive course and a driving range. 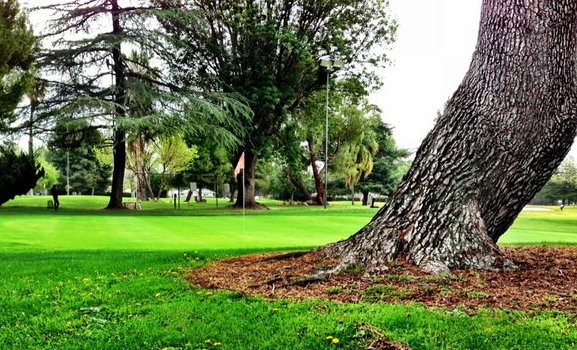 This review focuses on the 9 hole executive course. I really enjoyed playing this course. 9 holes, 3 of which are relatively short par 4’s in the 270-300 yard range. The holes have plenty of variation. There are a few trees and bunkers spread throughout. In the middle of the course there is a large concrete area, which appears to have been previously filled with water. The condition of the course is decent and so to are the greens. They are in fair condition, but you still see the odd hole and divot in them. The greens are nice and big – full sized. I am not so sure about the maintenance workers on this course. On one occasion they were changing the pin positions while we were playing. I would have thought that this would have been done at the start or end of the day’s play. On one par 4 hole (hole 6) we had taken our first shot. We were walking to take our second into the green and here came a golf cart with a golf course worker. He pulled out the flag, dug a new hole and placed the flag in a different location in the green. This all after we had already started to play the hole! This course is also the site of one of our most memorable rounds. We were partnered with a partially blind 95 year old World War 2 veteran, Dave. It was a privilege to play with him. As Dave was partially blind we assisted him with finding his ball after he hit it. Despite being 95, partially blind and showing up with a bunch of 50 year old clubs, he shot a way better score than either Chris or I.
good idea for a blog…I clicked over from CL…Some extra info that would round out your reviews would help out a bunch, i.e. Mats (the bane of muni golf) or Grass, rate the starter and the food facilities! Good Luck. Hi, thanks for the feedback. We have just got going and hope to have new content uploaded every few days. As you can see with my newer posts we are incorporating videos into the reviews to give a better impression of the course environment. Right now I am looking to spread the word and let people know that this resource is here for them. 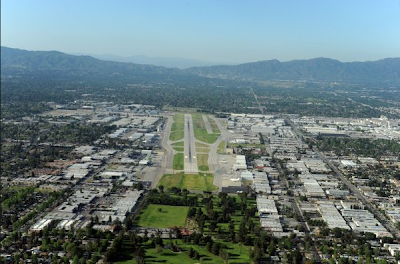 Just a correction: The Van Nuys Executive is just south of Van Nuys Airport. Whiteman Airport is in Pacoima about 10 miles away. I'm really enjoying your course reviews; good work! Thanks for the kind words. Please spread the word about the site!